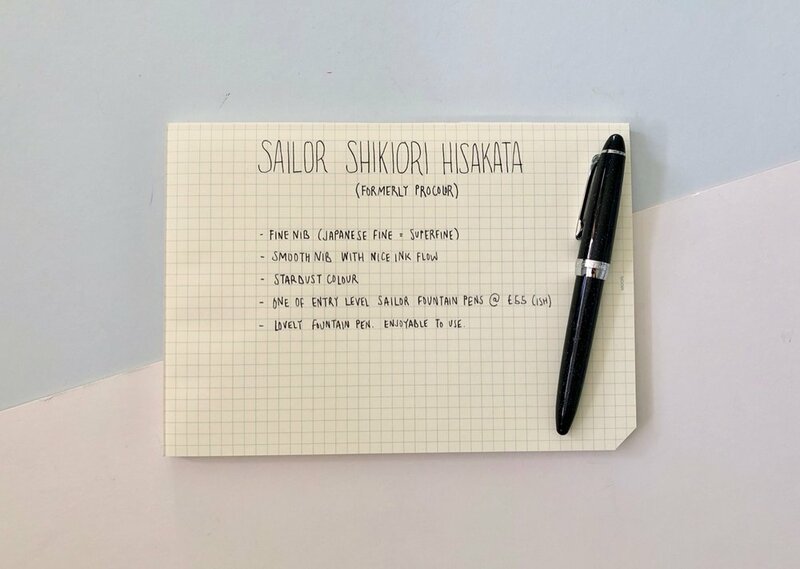 Sailor Shikiori Hisakata - Stardust Fountain Pen Review. The Sailor Shikiori Hisakata used to be known as the Sailor Procolor. I was lucky enough to be bought this pen as a gift from my husband. It's my first experience with a Sailor fountain pen and I think it's a great introduction. It comes in at a good price, approx £55 and is a great size. Plus there are some of the distinctive Sailor features available in this pen. My Shikiori Hisakata gets its Stardust name due to the barrel design. It has a resin body in a navy colour and throughout the barrel there are flecks of silver and blue that looks like Stardust or the night sky. I really love this design which is hard to emulate on a screen. In person and in the light the flecks within the pen body look wonderful. They really shine, but they’re not too bold and glittery. I’m not a glittery girl, but this works beautifully. The finish on the Stardust is chrome which compliments the colour nicely. Around the base of the pen cap there is quite a thick chrome ring which has the Sailor branding. Thee other chrome accents come from the pen clip and a ring around the top of the pen cap. Overall the amount of chrome detailing feels right. I have a fine nib which was purchased through The Writing Desk. This is the only nib size they have and as this is a Japanese brand the fine is very fine. The nib is small but the perfect size for this pen and it has some beautiful detailing that can be found on other Sailor fountain pens. This is a screw cap pen so your cap shouldn’t remove unnecessarily from the pen. The grip section has the same resin finish as the pen body which means that lovely design isn't broken up. It's comfortable to grip and I haven't experienced any slipping from the resin finish. This is my first Sailor fountain pen and it is completely lovely. It’s a really nice pen to use, the nib is smooth and you get a super fine line. The pen is comfortable to write with for long periods of time and the weight balance is good. It’s a £55 Sailor pen and I think a great entry into Sailor. There are cheaper Sailor fountain pens you could try such as the Lecoule but the Shikiori Hisakata is a much prettier design.